The poignant song, “Standing on the Shoulders”, was written by a lovely songwriter friend of mine, Joyce Rouse, and recently sung in it’s entirety by another dear songwriter friend, Lisa Silver, at the unveiling celebration of the new Women’s Suffrage Monument in Centennial Park in Nashville, TN. The lyrics were such an appropriate tribute to those women who bravely stood up for women’s right to vote. However, this lyric took on an even more personal meaning for me earlier this month when my former creative director and publisher at Zamalama Music, Kacey Jones, sadly lost her battle against cancer on September 1st. I felt heartbroken when I heard the news. Kacey was one of the women whose “shoulders I stood on”, in other words, one of my mentors. She probably didn’t realize it, but she was my “fearlessness” coach. Watching her “go for” whatever she set her mind to, helped teach me to reach further and be braver. On her Facebook page, there are memories and tributes posted from those who knew and loved her from the 1970’s to the present. She was: Kacey, the recording artist, the comedian, the singer-songwriter, the Shameless Hussie, the Sweet Potato Queen, the business woman, publisher, and record promoter, and the list goes on. To me, she was Kacey, the first person to believe in me and my songs enough to hire me as a staff songwriter for the few years that she ran a small indie publishing company between 1999-2001. She guided me toward my first hit song and we celebrated that accomplishment together. At the 2000 ASCAP Awards. 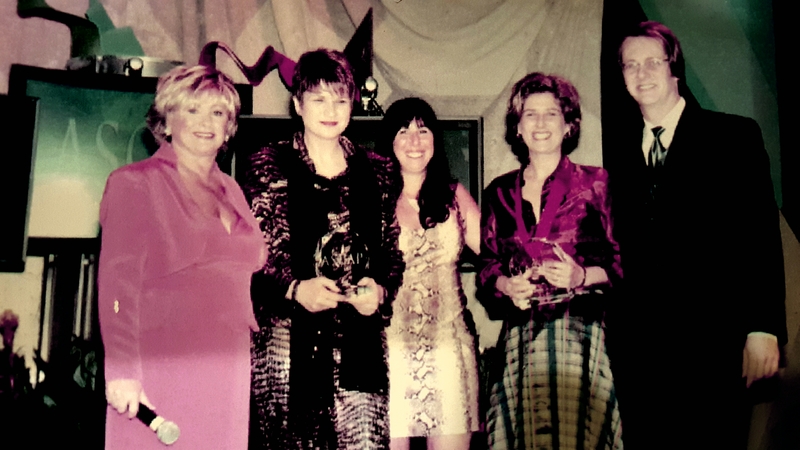 With Kacey Jones – a rare picture of her short-lived, short haircut – and Sharyn Lane, owner of Zamalama, and me second to the right, accepting an airplay award for “Home to You” recorded by John Michael Montgomery. (Excuse the poor picture quality, it’s been sitting on top of our piano for a long time). After my stint at Zamalama ended and the company catalog was sold, Kacey and I stayed in touch mostly through emails and Facebook. What I’ve realized through my grieving was that on a day-to-day level, I played a very brief and relatively minor role in Kacey’s diverse and well-lived life, yet her direct impact on my life was enormous. Did she know that? This led me to think of other women early in my music career who unwittingly have helped shape who I am. They are the ones who showed me (not told me!) how to conduct myself and move forward in this crazy music business. 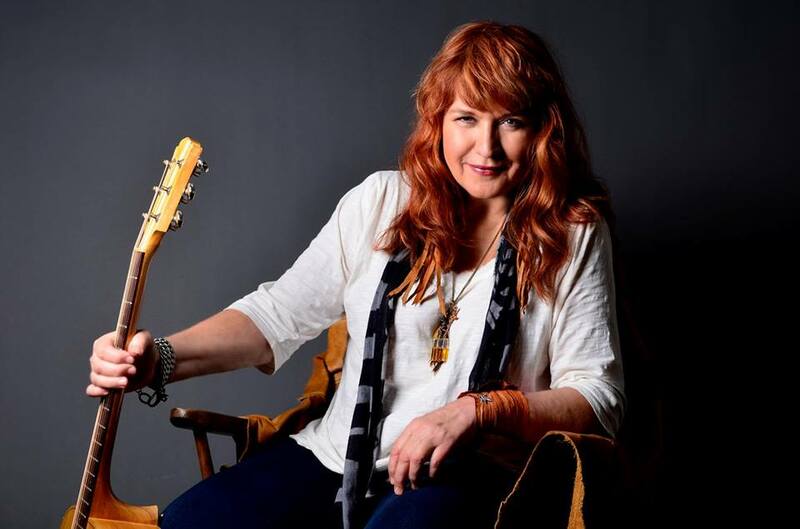 One of the first, Lisa Palas, who in the early 90’s was already a hit songwriter and signed with Reba McEntire’s publishing company, invited me to stay at her home while I was researching a possible move from New Jersey to Nashville, TN. She invited me to tag along with her to cool gatherings and let me know that I would have a friend if I moved here. This taught me that no matter how successful you become, it’s important to keep it real and be kind. Around that same time, Debbie Hupp, who co-wrote the Kenny Rogers mega-hit song “You Decorated My Life” took the time out of her life to sort through the pros and cons of being a woman in the music business and without mincing words let me know that if I didn’t move to Nashville and try, I’d regret it. She showed me that despite the odds, it’s okay to follow your dreams. When I actually did make the move to Nashville in 1992, I was quite timid about the whole songwriting thing. Then I was hired by the power-house then-Executive Director of the Nashville Songwriters Association, Pat Rogers, who taught me that being timid was a complete waste of time. She showed me that if you know something has to get done, make it happen even if it means being the tough one. What a great example of business moxie and fortitude which I needed to summon over and over again as I slugged away at the music industry beast. In my nascent efforts to become a professional songwriter there was one publisher, Karen Conrad, who was running a very successful independent publishing company, BMG, who always returned my phone calls even though I didn’t write for her company or have anything she truly needed or wanted from me. She returned my calls because it was the respectful thing to do, regardless of whether I was on my way up or down the ladder. That show of respect is something I’ve never forgotten and try to emulate in my own business dealings. To be fair, there have definitely been a few good men out there mentoring me and nudging me forward, not the least of which was my husband, Danny Arena. I’m not embarrassed to use the cliche that he is the wind beneath my wings. We formulated our songwriting dreams together. Moved to Nashville together. 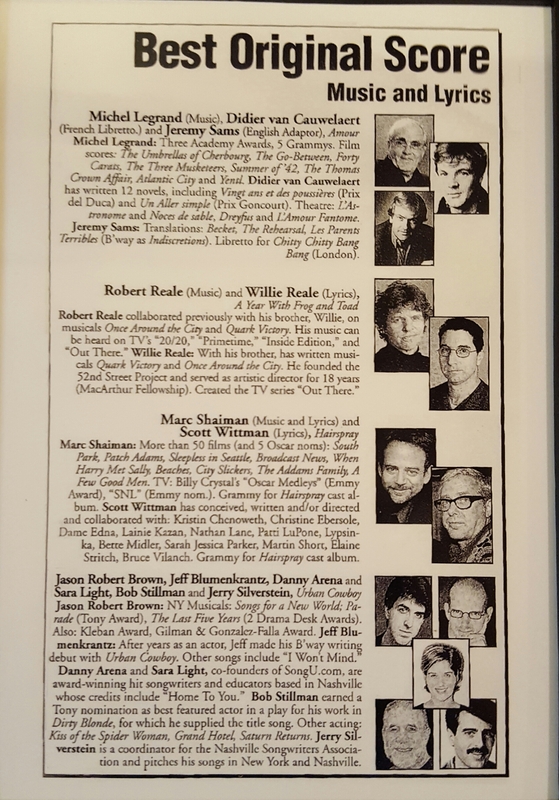 Every song I brought into my publishing deal with Kacey Jones had Danny’s name on it as a co-writer, and every songwriting and/or music business success I’ve had, has his mark on it, including our songs in “Urban Cowboy, the Musical” for which we were both nominated for Tonys. Danny taught me take it slow and to keep learning and growing along the way. 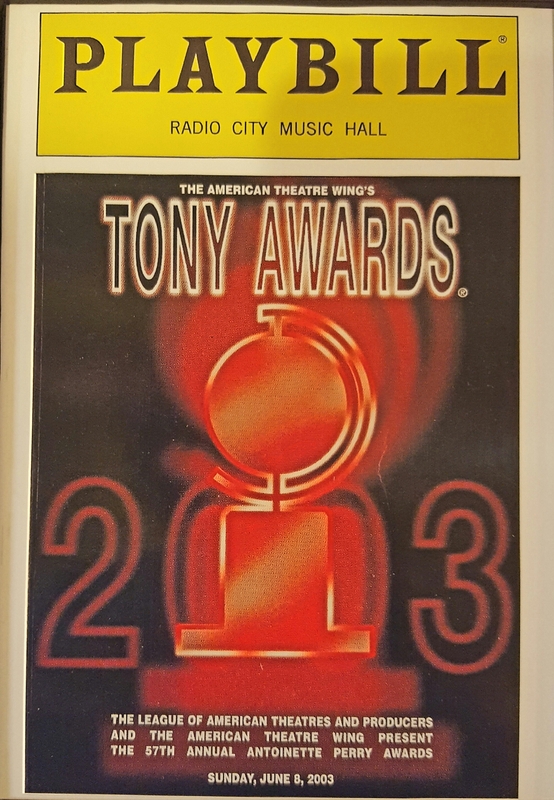 Playbill from the 2003 Tony Awards. Danny and I were part of the composing team for Urban Cowboy, the Musical, nominated for Best Original Score. Danny was thrilled that among the nominees that year was one of his composer idols, Michel LeGrand. Learning along the way was exactly what kept me going when the going got tough, and still does. Losing Kacey has given me a reason to pause and reflect on how much I appreciate all the people I learned from (and continue to) and the positive influences in my life. There are a multitude of other friends, teachers and mentors, both women and men, even serendipitous encounters with helpers whose shoulders were there for me, maybe not always to stand upon, but at least to lean my head on for awhile, and for all of them, I’m grateful. Categories: Business of Songwriting, Featured, Goals and Inspiration | Tags: ASCAP, Danny Arena, Debbie Hupp, Home to You, Joyce Rouse, Kacey Jones, Karen Conrad, Lisa Palas, Lisa Silver, Mentors, Pat Rogers, SongU, songwriting, Urban Cowboy Musical | Permalink.